The Long Beach ChannelPro SMB Forum will be a full-day live event and feature presentations from some of the top SMB resellers and managed service providers in the country, sharing their insights on the hottest tech solutions in the SMB marketplace today. You MUST attend! Who should attend: IT consultants, VARs, Integrators and Managed Service Providers of all types who are looking to grow their business. What's included: Free access to all sessions, learning materials, meals, parking, and prize giveaways. 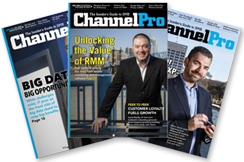 ChannelPro SMB Forum is designed to be a highly interactive, engagement-rich environment specifically to facilitate peer-to-peer networking. Beyond the numerous educational sessions, the Forum is a unique opportunity for you to strengthen current relationships, or build valuable new ones. Throughout the event, you will have numerous opportunities to interact formally and informally with your peers and make connections with new colleagues. Open to all ChannelPro SMB Forum attendees, this workshop will teach you some of the latest key industry trends and take you through highlights of both our on-premises and cloud-based solutions. You'll pick up key business insights from SolarWinds® MSP speakers, industry experts, and other successful MSPs. Earn promotional discounts just for taking a free trial. Be entered for the chance to walk away with a $100 Visa gift card. Learn more about SolarWinds MSP before the event begins. Join attendees, sponsors, the ChannelPro staff and some surpise guests for cocktail and tasty tidbits. SMBs increasingly want one-stop shopping from their technology providers—and if you don’t provide it, someone else will. Find out why the lines separating the IT, telco, and print channels are rapidly disappearing and how you can turn the coming channel convergence from competitive threat to bottom-line opportunity. Play along with ChannelPro Technical Editor Matt Whitlock as he guides you through the latest hardware trends and profit opportunities, game show style. Just remember to answer in the form of a question if you want to win one of our prizes! Is your business worth what you think it is? If you’re like most channel pros, the answer is probably no. In this hands-on, learn-by-doing workshop, experienced channel partner M&A consultants will help you calculate the real value of your business and then walk you through the concrete steps you should be taking now to maximize your selling price later when you’re ready to cash out. If finding a buyer for your practice is part of your exit plan, this is a session you literally can’t afford to miss. You talk to customers all the time, but never about the things you most need to know. What do they really think of your IT advice and sales presentation skills? What can you do to gain more of their trust—and business? Get the answers to those and other questions from our panel of experts and real-world business owners who have agreed to tell the whole truth and nothing but the truth about technology providers like you. The explosive rise of ransomware has even tight-fisted SMB owners spending more heavily on security. How can you profit from that trend, and which of the ever-widening variety of security systems should you be selling to your customers? This fast-paced session will walk you through the risks and rewards of creating a specialized security practice, and provide expert tips on the traditional and next-generation security technologies you should be using to protect your customers. We wrap up the event with sponsor awards, cool gear giveaways and cash prizes! Treat yourself to the resort-like atmosphere and convenient location of a Long Beach Hotel near top attractions. Featuring modern accommodations and event space, the Long Beach Marriott offers luxurious Marriott Revive bedding, flat screen HDTVs, and sleek new décor just minutes from major sports teams, breathtaking beaches, and top corporations. Take delight in the unmatched airport convenience of this hotel near Long Beach, offering complimentary airport shuttle and free self-parking. Book directly within the ChannelPro SMB Forum group room block by CLICKING HERE or dial 562-425-5210 to make your reservations by phone. Be sure to reference the ChannelPro SMB Forum group when you make your reservation to receive the discounted room rate. Complimentary hotel airport shuttle service is available upon request. Shuttle phone: 562-425-5210 x0. Long Beach Marriott does not provide shuttle service for this airport. Ashley Smith is responsible for business development for the CLOUDSolv team at SYNNEX. She arrived at SYNNEX in 2014 specializing in the Red Hat line, and today she is responsible for working with the distributor’s partners on a daily basis to help them build their cloud practices. Click to play the full video "ChannelPro SMB Forum 2017: Long Beach Silver Selfie"